Although the British Post Office prohibited the overseas transmission by letter post of lottery tickets or advertisements, it was difficult to enforce the ban. Receiver countries such as the United States were better placed to identify mail containing prohibited matter. 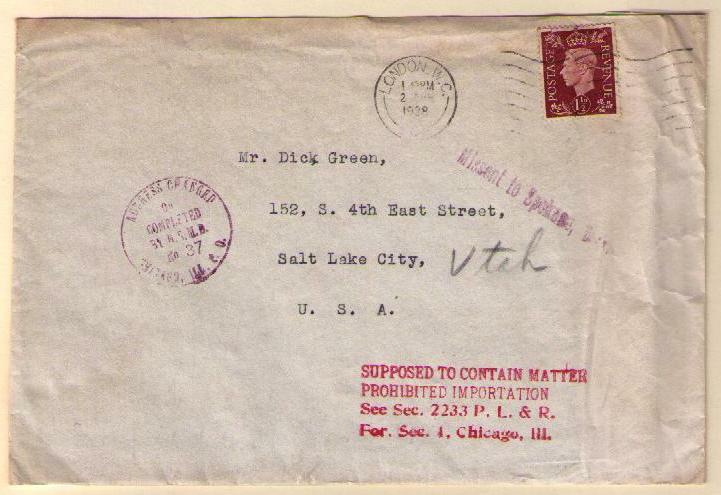 Upon receipt of a letter or package at the office of delivery from an exchange office stamped or endorsed, "supposed to contain matter prohibited importation", the postmaster shall at once notify the nearest customs officer and the addressee of the receipt of such letter or package and set a time for the addressee to appear and open the same in the presence of a customs officer. The letters below were suspected of containing prohibited matter. 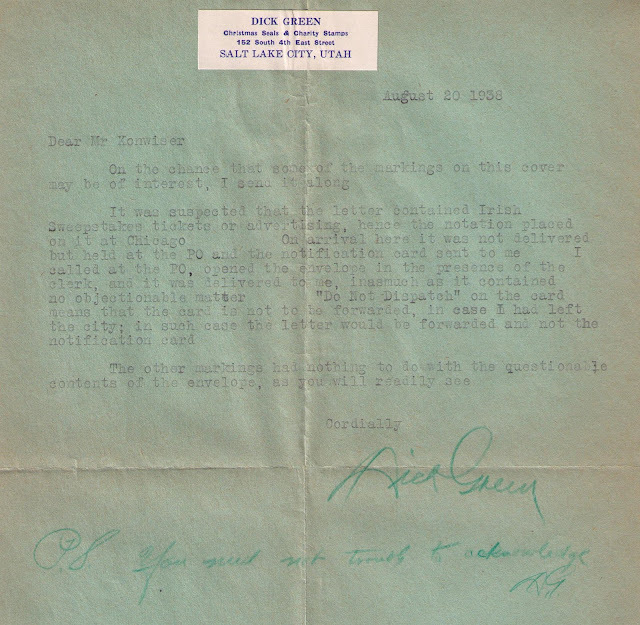 The first letter was mailed from London to Salt Lake City, April 2, 1938. The Chicago exchange office suspected that the letter contained lottery items. See Sec. 2233 P.L. & R.
For. Sec. 1, Chicago, Ill. It was suspected that the letter contained Irish Sweepstakes tickets or advertising, hence the notation placed on it at Chicago. On arrival here it was not delivered but held at the PO and the notification card sent to me. I called at the PO, opened the envelope in the presence of the clerk, and it was delivered to me, inasmuch as it contained no objectionable matter. 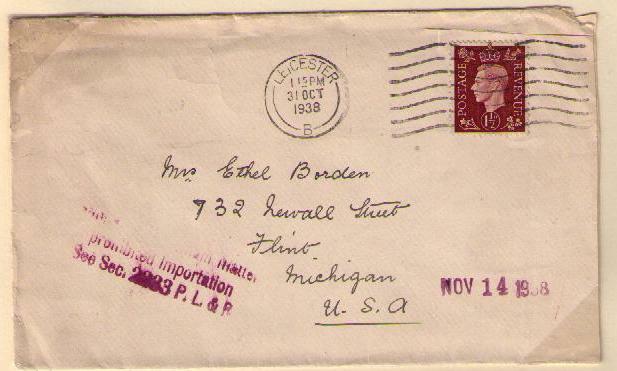 The second cover (below) was mailed from Leicester to Flint, Michigan, on October 31, 1938.